Wesleyan Methodism was one of the flourishing denominations of the Hawthorn municipality in the second half of the nineteenth century. 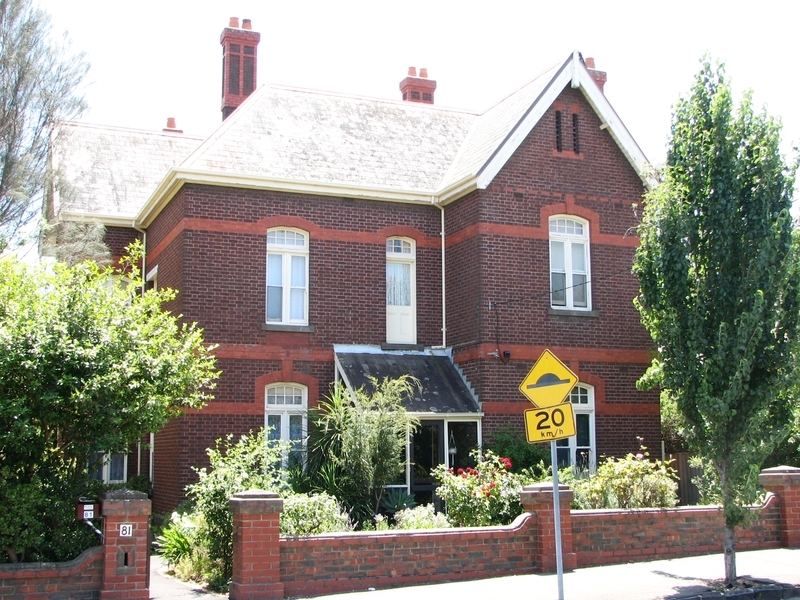 The local Methodist community was known as the "Hawthorn Circuit" and such was its influence that it was responsible for the establishment in 1881 of the Methodist Ladies' College (MLC), one of Melbourne's leading secondary schools for girls. 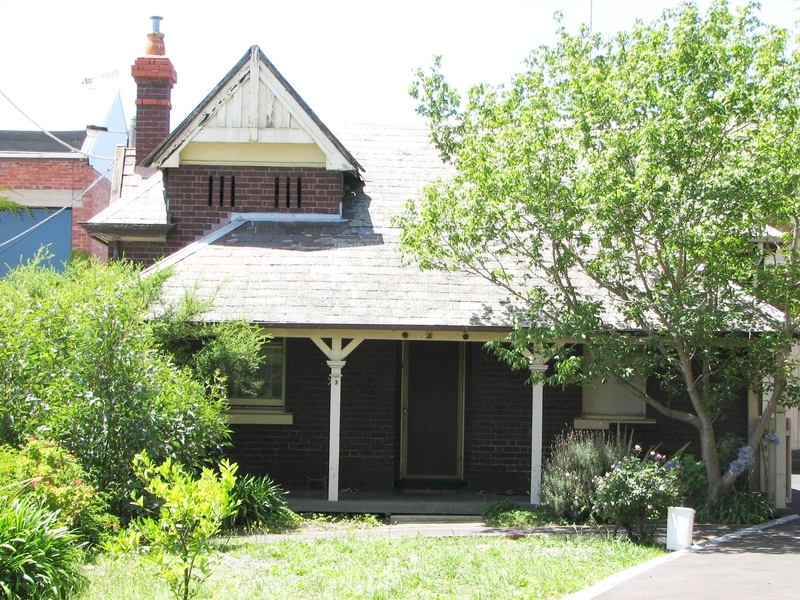 Between the 1840s and 1880s the Hawthorn Circuit occupied and subsequently outgrew a number of buildings until in 1886 a new, considerably larger, site was selected on the corner of Oxley Road and Hepburn Street. The Trustees advertised in the Argus, inviting 'competitive designs for church, school and parsonage' on the new site. The successful design was submitted by talented young Melbourne architect Alfred Dunn, who designed a number of churches for the Wesleyans. Once begun, the entire complex took less than two years to construct and was completed in 1890. Dunn died at the age of 29, only a few years after the Auburn complex was finished. The complex consists of a main church building, a church hall, parsonage, caretaker's cottage, former stables, and a former infants school. The perimeter brick wall may have replaced an earlier timber picket fence. However, it is the church itself which provided the symbol of the Hawthorn's Circuit's affluence, hailed as one of the finest Wesleyan Methodist churches in Victoria. Constructed on a hill, it became a prominent local landmark. The main church building is constructed in the Lombardic Romanesque style. The predominant theme is the use of banded, dichromatic brickwork of Hawthorn browns contrasted with deep reds. The dominant element of the church is its multi-levelled tower, which addresses the corner of Oxley Road and Hepburn Street. The main body of the church is two storeys high with a slate roof and has prominent balconies and gables addressing the streets. The relatively plain interior, with some classical detailing of pilasters with Corinthian capitals, is largely intact. It is arranged as a rectangular auditorium with original pews on a raked floor overlooking the chancel and the visual centrepiece of the church, the 1889 organ designed by Fincham and Hobday. The parsonage, hall and cottage are architecturally complementary to the church building, similarly employing banded dichromatic brickwork on basalt plinths with slate roofs. The hall is a substantial building with separate entrances for boys and girls, a central stage with radiating classrooms and sliding dividing doors. In 1902 the Wesleyan Methodists became part of the Methodist Church in Australia, which in turn combined with the Congregationalists and Presbyterians in 1977 to become the Uniting Church in Australia. Since that date the church has been known as the Auburn Uniting Church. 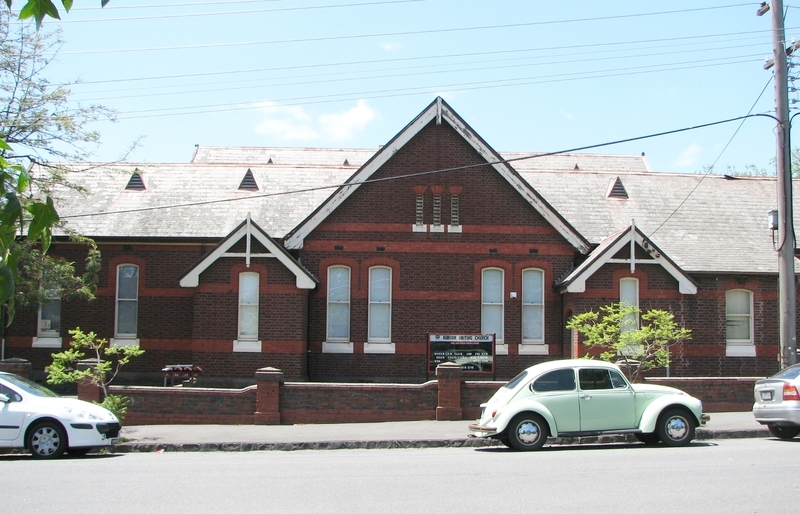 The Auburn Uniting Church Complex is historically and architecturally significant to the State of Victoria. 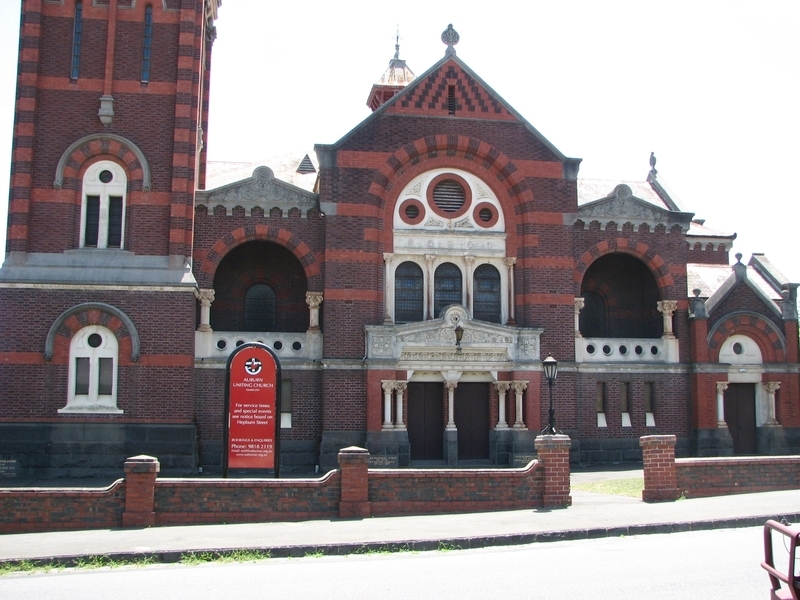 The Auburn Uniting Church Complex is historically significant as the major nineteenth century Wesleyan complex in Victoria. It is unusual as an example of a complete, intact and little altered set of church buildings built simultaneously to one design. It is in contrast to other historical ecclesiastical complexes that have evolved over a longer period of time. 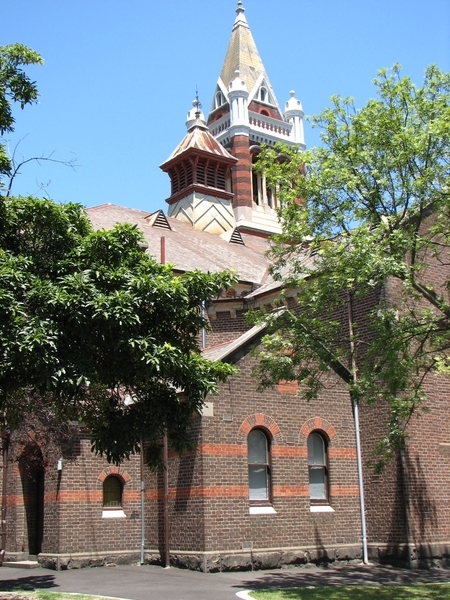 The complex is historically significant for its early associations with Wesleyan Methodism, an important religious congregation in colonial Victoria, and with the influential Hawthorn Methodist circuit. 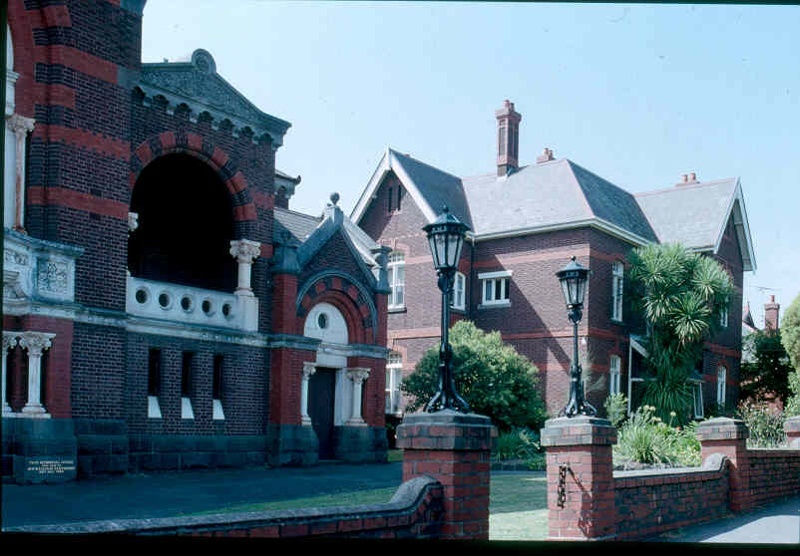 With one of the largest church memberships, this circuit had the finest set of properties in Victoria and was responsible for the foundation of Methodist Ladies' College, a leading educational establishment for girls. 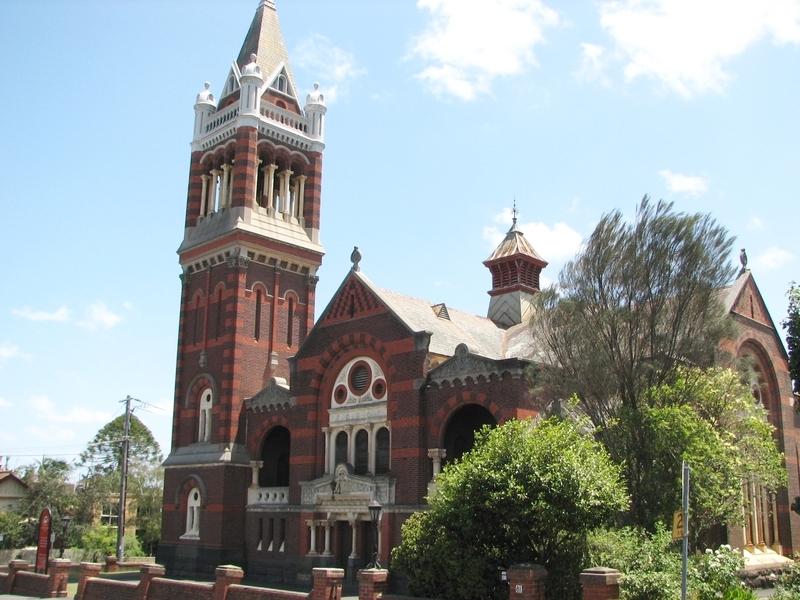 The Auburn Uniting Church Complex is architecturally significant as the finest example of Lombardic Romanesque church design in Australia. 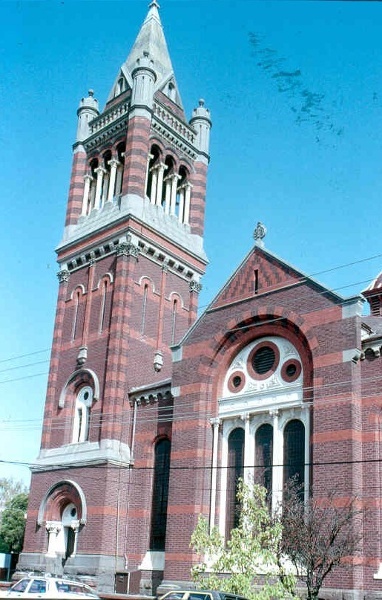 The church was hailed contemporarily as one of the finest Wesleyan churches in Victoria, and has subsequently been described as a cathedral of Victorian Wesleyanism. The church building is architecturally significant as the major work by the young and brilliant architect Alfred Dunn. 1. 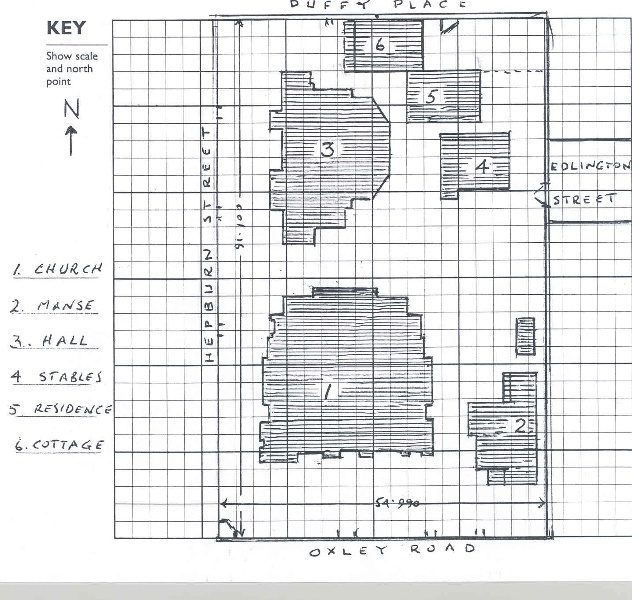 All the buildings marked B1 Church, B2 Parsonage, B3 Sunday School, B4 former stables, B5 former Infants School, B6 Caretaker's Cottage, B7 wall, as shown on Plan No. H2034 held by the Executive Director. 2. All the land marked L1 on Plan No H2034 held by the Executive Director,being the land described in Certificate of Title Volume 2104 Folio 420679. 3. All the objects, being the pews. Wesleyan Methodism was one of the predominant religious denominations of the Hawthorn municipality in the second half of the nineteenth century. The Wesleyan Methodist Church on Oxley Road was to be the fourth Wesleyan Methodist church in Hawthorn. 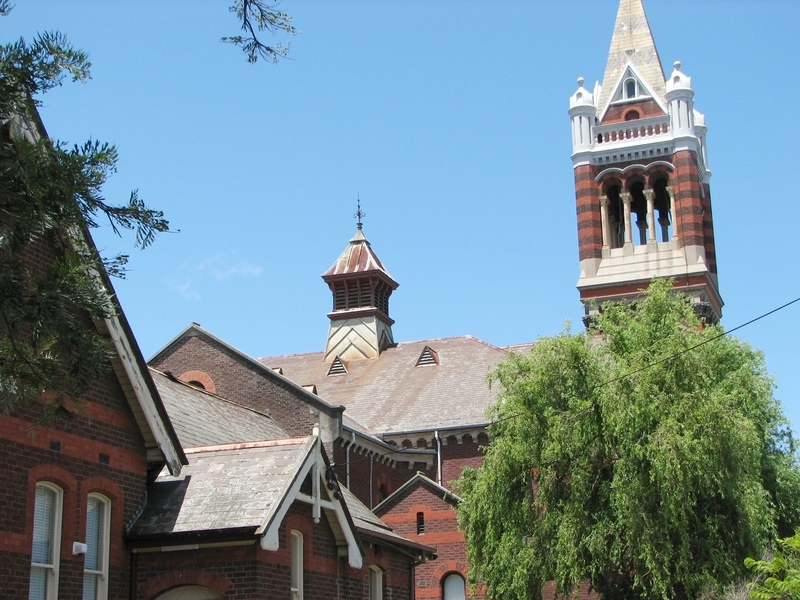 The local Methodist community was known as the "Hawthorn Circuit" and such was its influence that it was responsible for the establishment in 1881 of the Methodist Ladies' College, one of Melbourne's leading secondary schools for girls. The first Methodist services in Hawthorn in the 1840s and 1850s were held in a variety of locations and buildings, including under a tree (on the corner of Riversdale Road and Auburn Road), a framed tent, a weatherboard building and private residences. The existing congregations in Hawthorn united in 1855 to erect a brick church in Riversdale Road, which was later sold (and subsequently demolished) in order to provide a larger building. A larger church was built in Burwood Road in 1856 and by 1872 the church had also begun to outgrow this building. 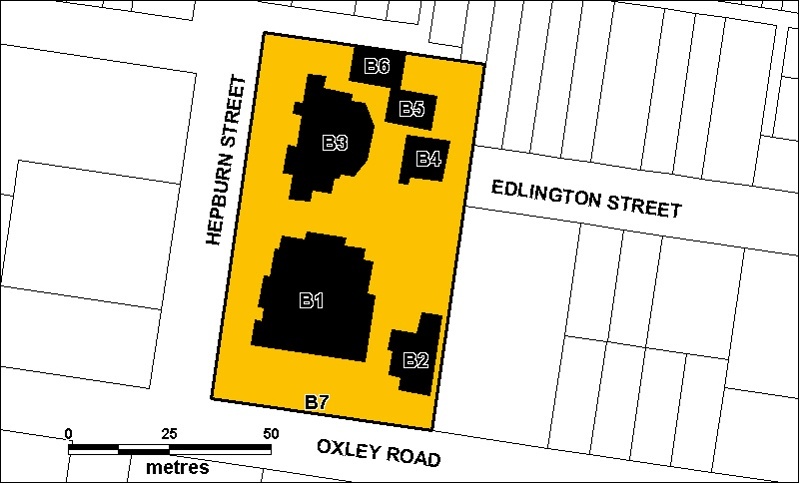 A new, considerably larger, site was selected on the corner of Oxley Road and Hepburn Street, with the sale of the Burwood Road building to be used to finance the new church complex. With the selection of the site, planning for the new complex proceeded slowly. Finally, in October 1884 the Trustees of the Wesleyan Church, Hawthorn, advertised in The Argus, inviting 'competitive designs for church, school and parsonage' on the new site. The successful design was submitted by talented young Melbourne architect Alfred Dunn, who subsequently put the construction project to tender in April 1888, engaging the Brewer Brothers of Clifton Hill to undertake the construction. By March 1889 all buildings on site had been completed apart from the caretaker's cottage and fencing around the buildings. These were subsequently completed by early 1890. The entire Auburn Wesleyan Methodist Church complex had been completed within two years. When completed, the complex consisted of a main church building, a hall/Sunday School, a manse/parsonage, caretaker's residence and stables. However, it was the church itself which provided the symbol of the Hawthorn's Circle's affluence, hailed as the finest Wesleyan Methodist Church in Victoria. Constructed on a hill, it became a prominent local landmark. Alfred Dunn commenced a promising career in architecture in his early twenties, rapidly gaining a reputation for imaginative designs, especially in his ecclesiastical work. 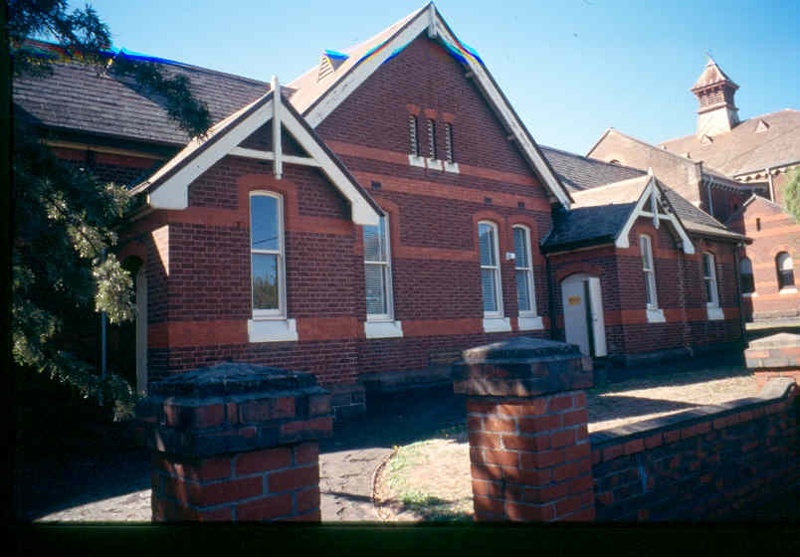 One of his first major projects was the model Sunday School building attached to the Percy Oakden designed Brunswick Wesleyan Methodist Church in 1887, thus commencing a strong working relationship between Dunn and the Methodists. At the same time as designing the Wesleyan complex at Hawthorn he created a similar design for the Wesleyan congregation at Preston, although less elaborate and in a more Gothic mould. Being young and unestablished, Dunn achieved most of his appointments through entering design competitions and contests for building projects. 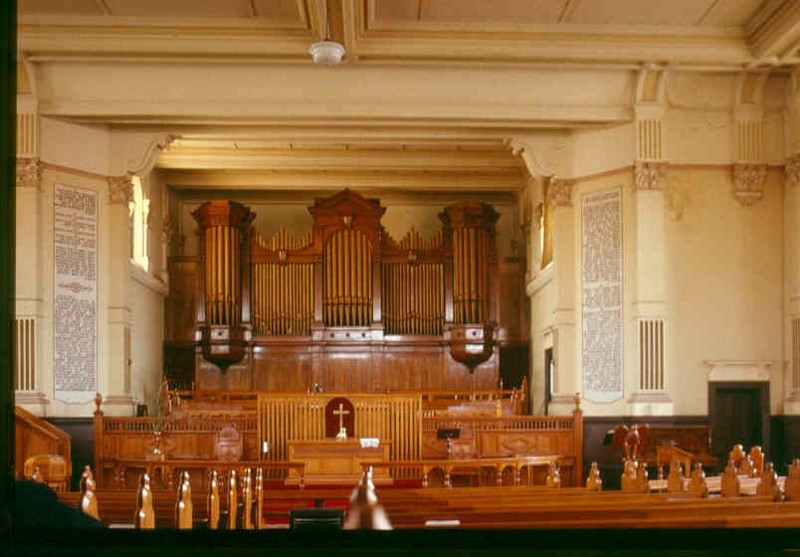 It was through this process that he produced designs for the Wesleyan Methodist Church in Hawthorn; he was also co-winner for the design of the acclaimed interiors of the (former) Commercial Bank of Australia Banking Chambers in 1893, a collaboration between himself and Lloyd Tayler. Sadly, Dunn's promising career was cut short by his tragic death, at the early age of 29, in 1894. TO THE LATER DECLINE OF THE CONGREGATION THIS CENTURY, THE COMPLEX AS A WHOLE IS REMARKABLY INTACT AND THUS A MONUMENT TO THE SOCIAL AFFLUENCE AND OPTIMISM OF THE LATER 1880'S. THE MANSE IS A SUBSTANTIAL RESIDENCE AND IMPORTANT AS A PRINCIPAL MEMBER OF THE GROUP. THE ORIGINAL DOUBLE STOREY VERANDAH WAS REMOVED SOME TIME AGO. This church complex was built for the Wesleyan Methodists between 1888 and 1890. Designed by architect Alfred Dunn, the church is in the Lombardic Romanesque style and is one of the finest Wesleyan churches in Victoria. * Removal of paint from originally unpainted masonry. * Removal of paint from originally unpainted or oiled joinery, doors, architraves and skirtings. The purpose of the exemptions is to allow works that do not affect the cultural heritage significance of the place. The entire complex has a very high degree of integrity, and has been well maintained. (The Sunday School has a small single storey kitchen addition which has partly obscured the full length triple windows that visually linked the school to the main church. A two storey verandah has been removed from the manse). Permit policy should be to retain the architectural integrity of the complex. The interior of the manse retains its plan (like all the buildings) but the permit exemptions will allow flexibility for updating of services and redecorating as required. The original interior paint and decorative scheme of the church building should be established before repainting the interior. Repainting of external masonry, timberand cast iron should be permitted upon satisfactory evidence of original colour schemes.